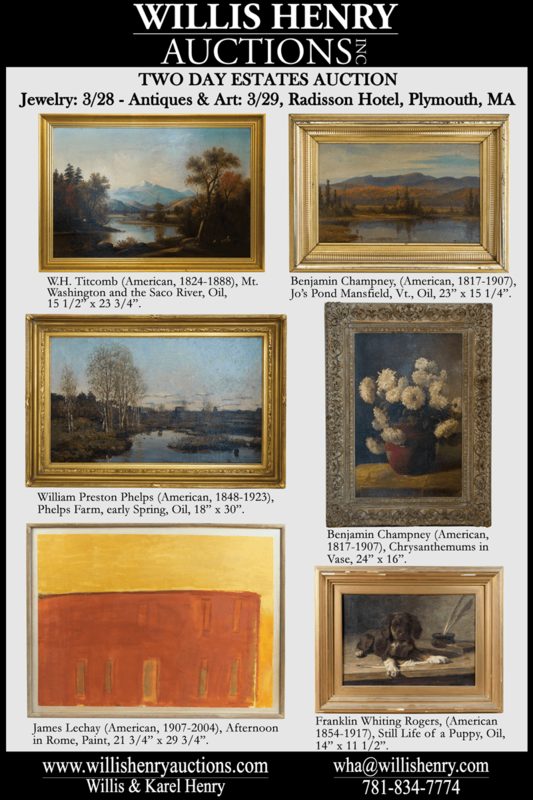 Two Days Estates Auction - March 28-29, 2015 - Willis Henry Auctions, Inc. IMPORTANT: No Absentee or Phone bids will be accepted ONE HOUR before auction starts. 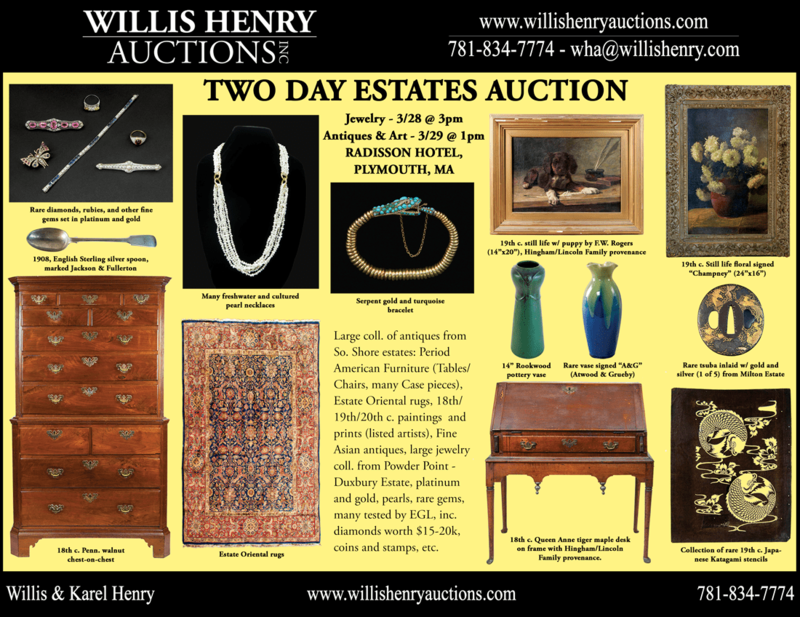 Saturday, March 28th at 3pm: A wonderful collection of approximately 80 lots of jewelry (most from the estate of Priscilla Alden (Crocker) Archibald of Powder Point, Duxbury, MA and from Nina and William Moore’s estate in Milton, MA). Several lots were appraised by EGL USA with values ranging from $2,000 to $30,000 (diamonds, sapphires, and pearls). Other jewelry includes many precious & semi precious gems set in platinum, gold and sterling necklaces, bracelets, rings, earrings, pins, tuxedo sets as well as several gold watches. Many necklaces made of multiple strands of fresh water pearls with gold clasps, cultured round pearl single and double stand necklaces will be sold. Signed American & European jewelry and American Indian (Navajo and Zuni Pawn), Georg Jensen and Tiffany pieces. The collection spans the 19th c., turn of the century Georgian pieces, Art deco and nouveau and many other vintage jewelry including, 50’s, modern, & 70’s, etc. Sunday, March 29th at 1:00pm: Furniture, Art & Accessories to be auctioned include an 18th c. desk from the South Shore in tiger maple and chestnut with an old crackle finish, passed down from the Solomon Lincoln family of Hingham, MA; Chippendale chest on chest, attributed to Delaware River Valley craftsmanship; early 19th c. Federal two-piece secretary in mahogany with glazed door top; finely inlaid card table from the North Shore (MA); 18th c. Queen Anne tiptop tea table with snake legs; early 18th c. maple and ash armchair with tall turned finials; 18th c. maple and pine corner chair with brown/red stain; Sheraton diminutive drop leaf table on wheels; two Chippendale tall chests with six graduated drawers; several Chippendale four-drawer chests; set of six 19th c. birdcage Windsor armchairs; set of six 19th c. Pennsylvania plank seat side chairs; 19th c. Federal diminutive three-drawer chest; three 18th c. Governor Winthrop desks; and several other desks, chests, sets of chairs, blanket chests, dining tables, etc. An opportunity to buy antique furniture for redecorating homes as there are many period chests of drawers, dining and side tables, sets of chairs, and cupboards in large quantities.